With summer and Fourth of July weekend in full swing, we got busy in the kitchen and came up with the perfect tasty picnic recipe combos that are easy to make and sure to impress. Picnic as a fun date idea in the summer when the weather is perfect or you’re on a budget. We’ve gotten creative with the typical favorite classics for you like corn on the cob, potato salad, lemonade and chocolate chip cookies. 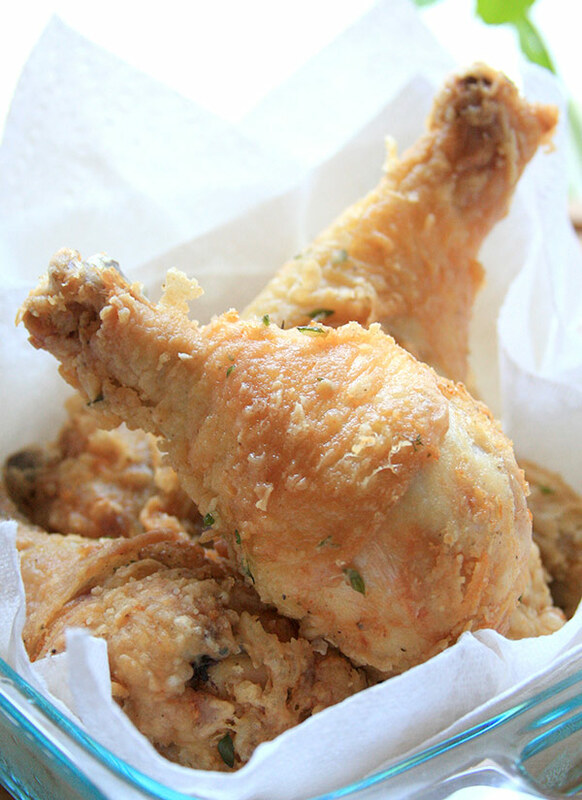 We decided to keep the fried chicken southern and classic though, because it’s hard to beat southern fried chicken. Enjoy these yummy treats, have fun in the summer sun and have a happy Fourth of July!! This is a rather simple recipe but yields great taste every time. Before you do anything with the chicken, you are going to have to mix up some buttermilk. To do this pour 3 cups of milk into a large mixing bowl, then add 3 tbsp of either lemon juice or white vinegar to the milk and stir. Congratulations! You have now created buttermilk. After this, mix in the salt, pepper, and cayenne pepper. 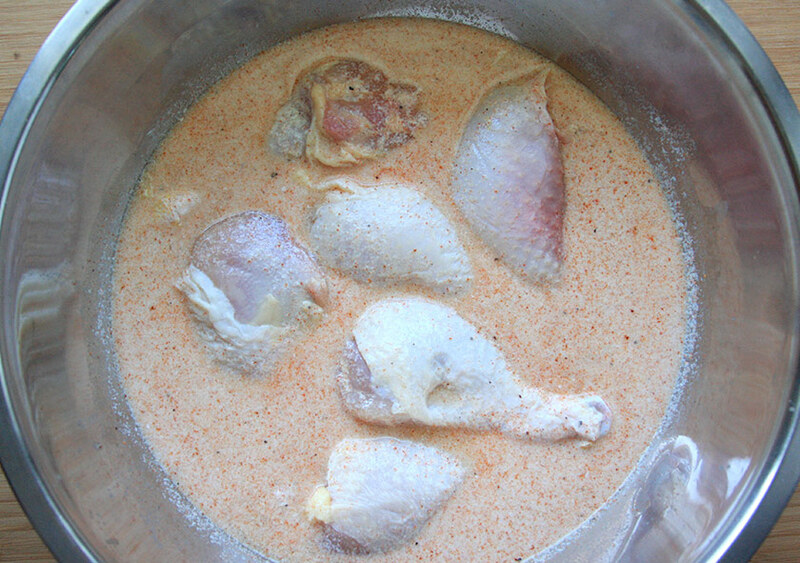 With this buttermilk spice mix you can add your chicken. 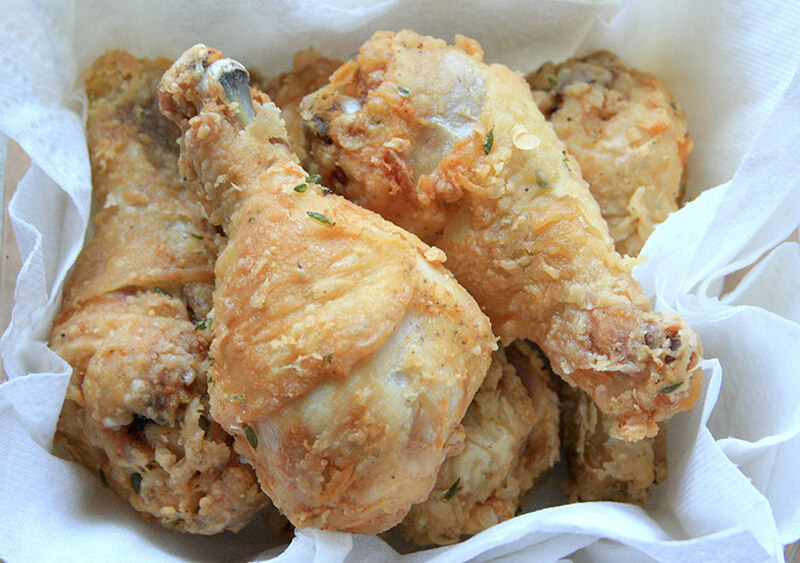 We prefer to do chicken drumsticks for our fried chicken but chicken breasts work great too. Now let the chicken soak in this mixture for about 2 hours or overnight. Place in the refrigerator during this soaking process. Once your chicken is about ready, you can start mixing up the breading. 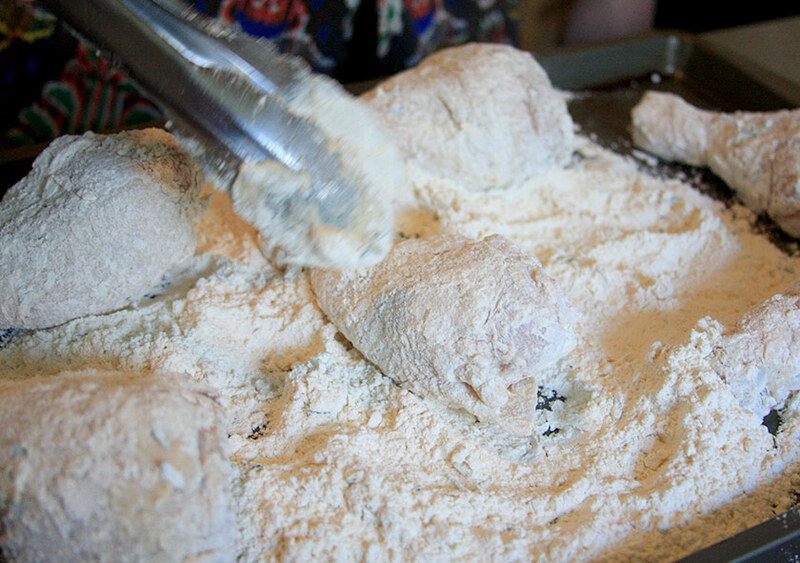 Mix the flour, thyme, salt, and pepper together and then either put into a mixing bowl or on a baking sheet so that you can roll the chicken in the breading. Bread all the pieces of chicken and coat them as evenly as possible. You can either use your hands to pat off the excess breading or just tap the chicken on the side of the bowl so any loose flour comes off. Once all of your chicken is breaded put the pieces in the fryer (make sure to heat the vegetable oil to about 350 degrees F). You can leave the chicken in for about 15 minutes, just make sure to have a thermometer on hand so you can check the internal temperature of the chicken (it should be around 165 degrees F). Once the chicken has turned a golden color and the internal temperature is good you can remove the chicken from the oil and set it on a plate with a paper towel to soak up any excess oil. You now have some delicious fired chicken that should be eaten as soon as physically possible, let it cool until you can actually handle the temperature in your mouth. You have been warned. 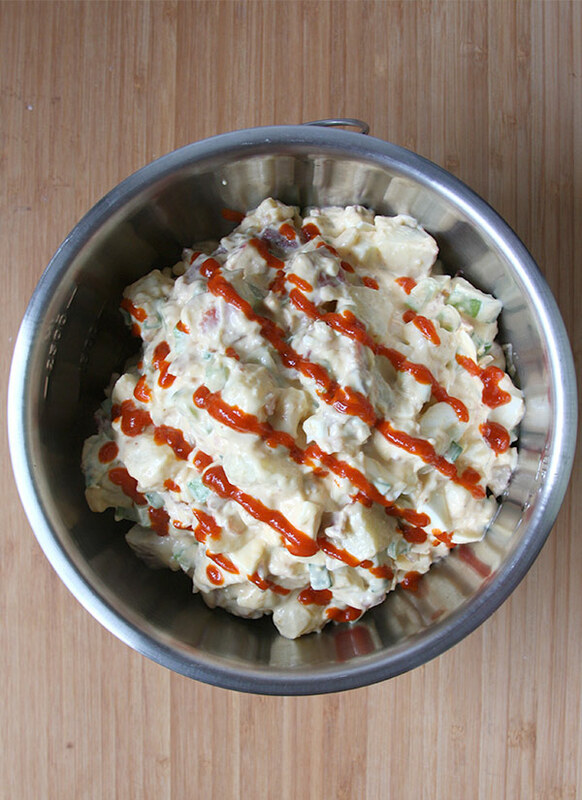 Note: For potato salad, we recommend making it the day before so you can allow the flavor to combine overnight. 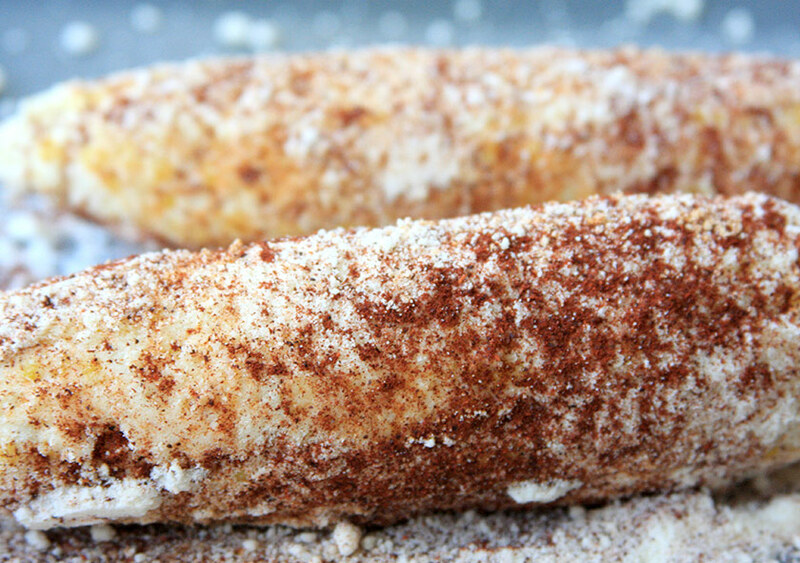 This recipe is a yummy twist on a traditional American favorite and is rather simple to make. Dice potatoes and boil until cooked (test with a fork). I like to leave the skin on potatoes for the extra texture and color. Drain and set aside to cool and then fry bacon until crisp. Once the bacon has cooled, tear apart into small pieces and place into a large mixing bowl. Hard boil eggs for 12 minutes and then place into ice water. Once the eggs have cooled, peel, dice and add to the mixing bowl. Dice celery and scallions and add to the bowl. 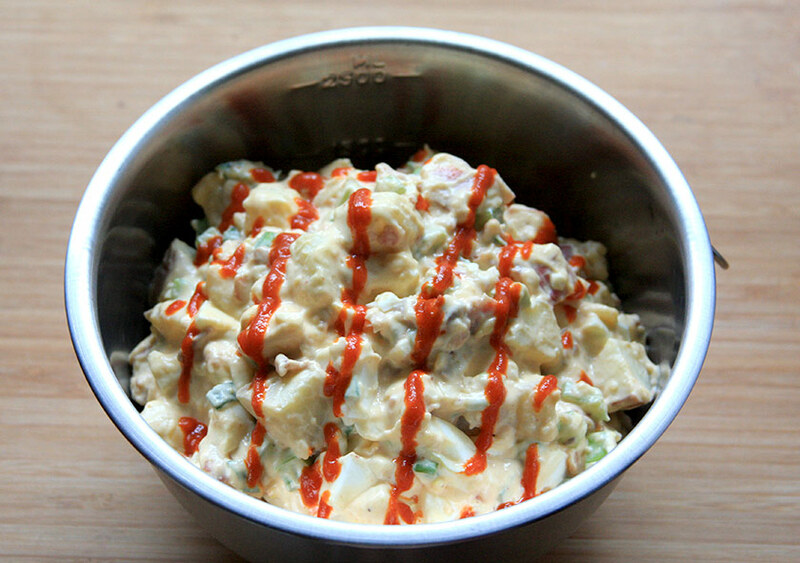 Combine mayonnaise, cider vinegar, sugar, salt, garlic powder, mustard and sriracha into the mixing bowl. Stir together and then refrigerate until ready to serve. 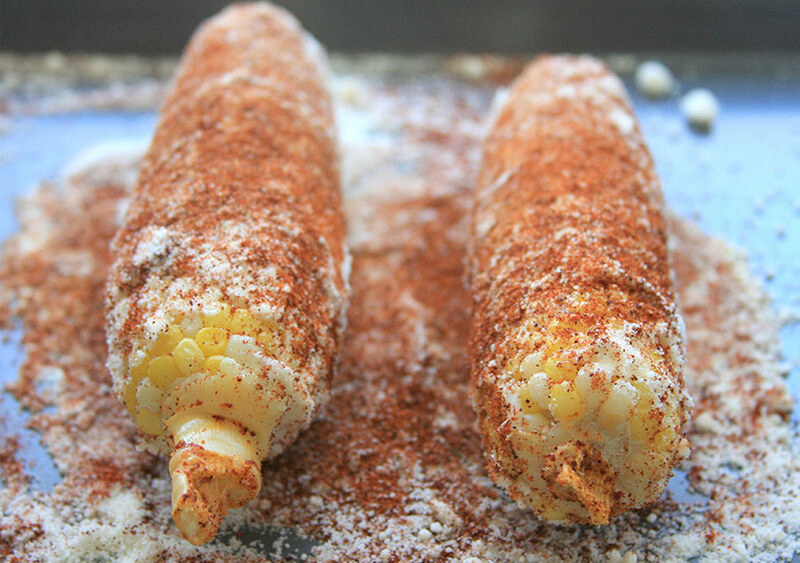 This is a southern California favorite and a must have for picnics and BBQ’s. Boil corn for 5 minutes. 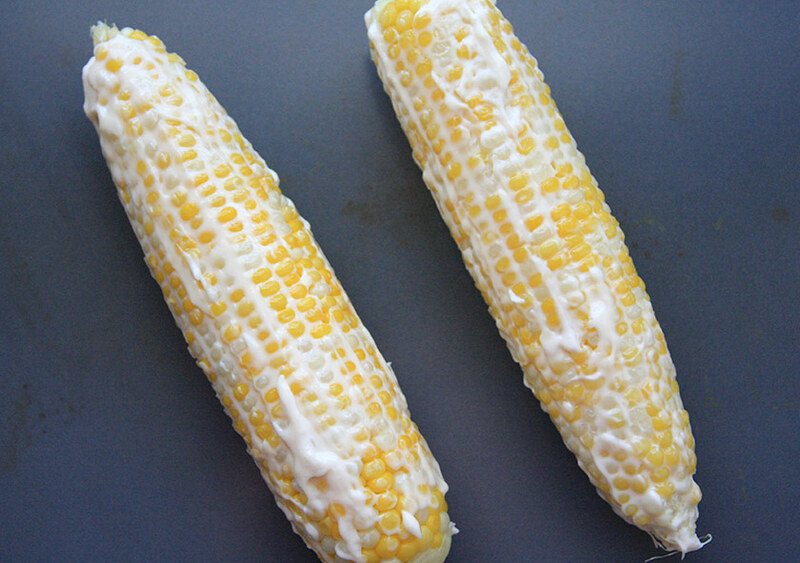 Once the corn is done, evenly spread a thin layer of mayo on each cob. 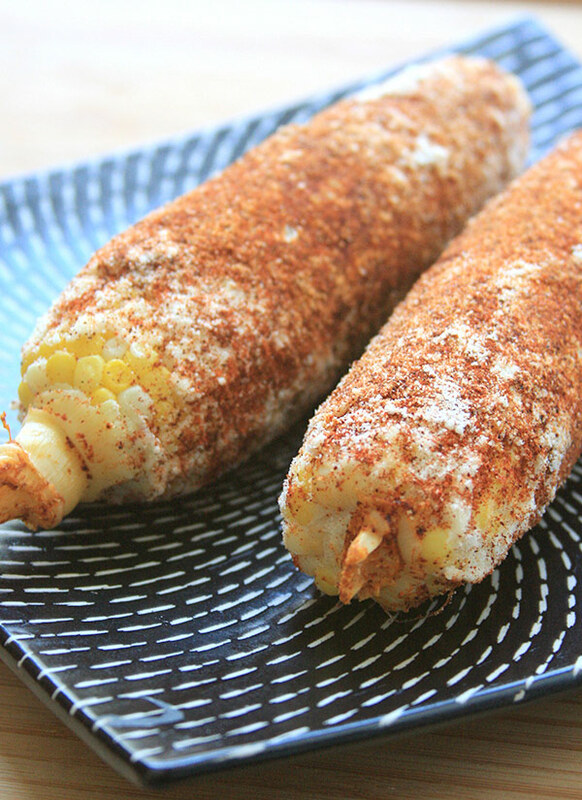 Thickly sprinkle Parmesan onto the corn, enough to coat the whole piece so no yellow is showing. Evenly sprinkle chili powder over the Parmesan cheese and then lightly sprinkle another layer of pico de gallo. Because the pico de gallo is such a strong taste and is spicy, add as much or as little as you want as it’s all a matter of preference. This isn’t just the regular, run of the mill lemonade. The added mint makes the lemonade a refreshing treat on a hot summer’s day. Boil 1 cup of water, stir in sugar until diluted and set aside to cool. Squeeze and strain lemons. Combine lemon juice, sugar syrup and three cups of cold water into a pitcher. 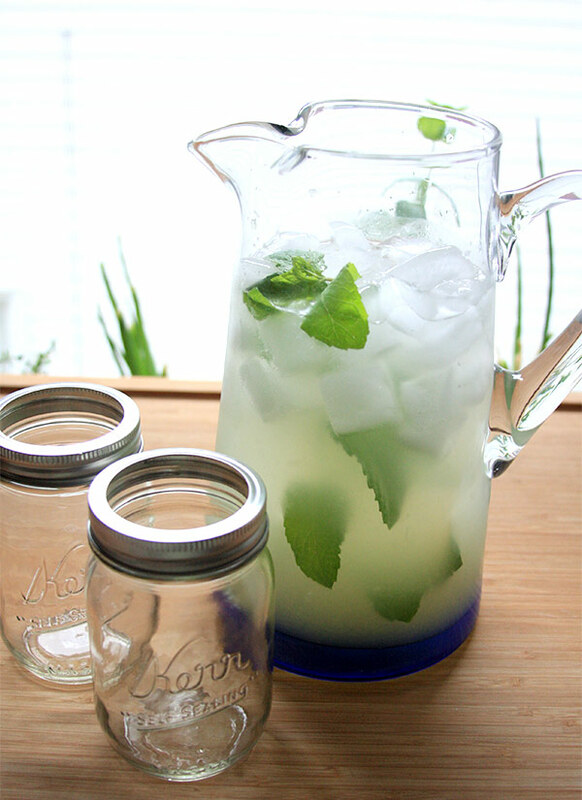 Add the sprigs of mint to the pitcher and refrigerate for an hour or more. 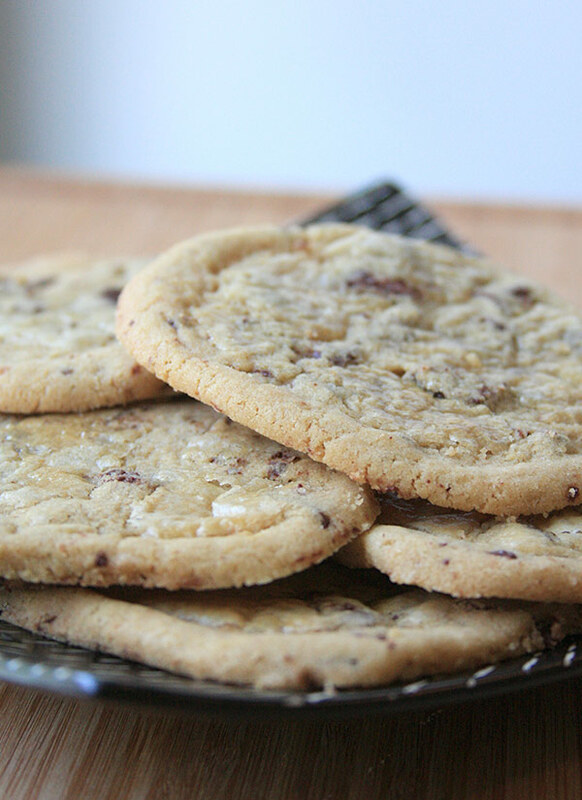 These are some of the best cookies we’ve ever made. Refrigerate the chocolate ahead of time as this will help when you break it apart later. While the chocolate is hardening, mix both the butter, dark brown sugar and granulated sugar together. Beat in the egg yokes and then add in the vanilla. 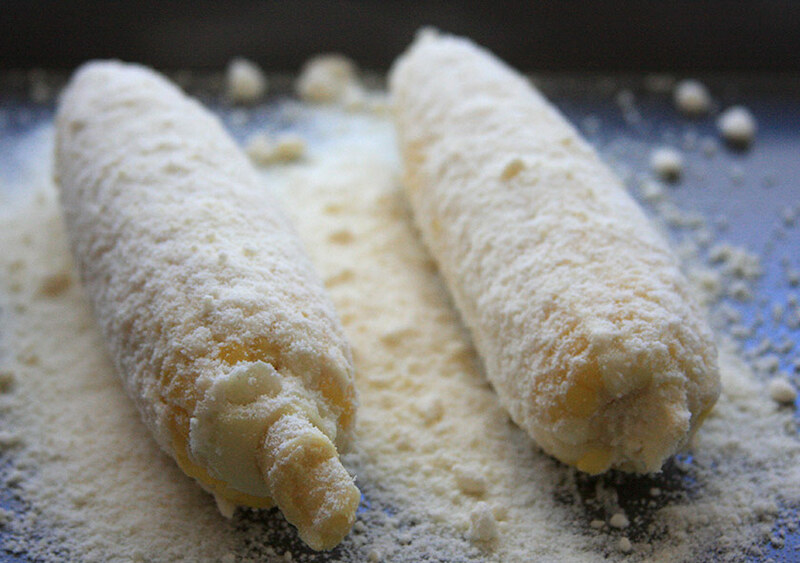 Blend the flour, baking soda, salt and add it to the previous mixture. Separate the dough into three portions and pat them each into 4 by 6 inch rectangles. Wrap them in Saran Wrap and refrigerate for 30 minutes. While the dough is chilling, preheat the oven to 375 degrees. 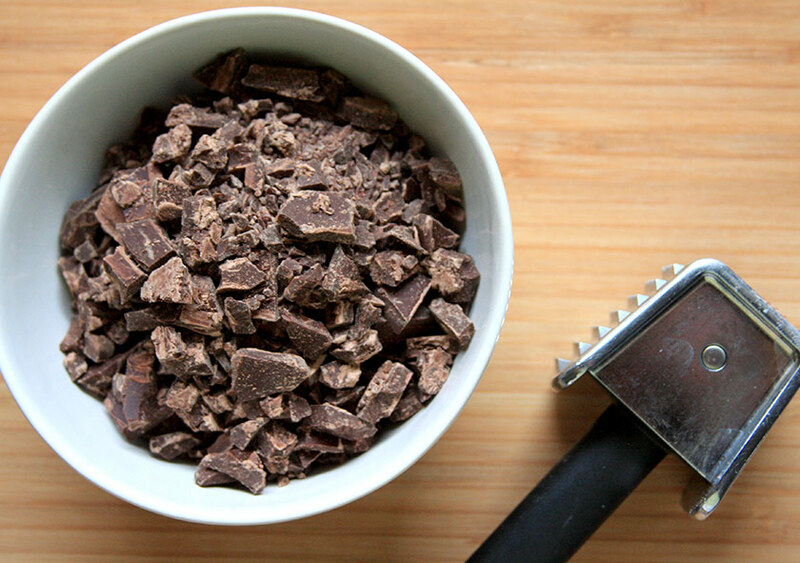 Coarsely chop the chocolate bars into thin shards. We did this by covering them with a napkin and beating them with a tenderizer or what I like to call, meat hammer. Set aside the chocolate and lightly flour the counter top for the dough. Once the dough is finished chilling, lay the first piece onto the counter and sprinkle half of the chocolate shards on it. 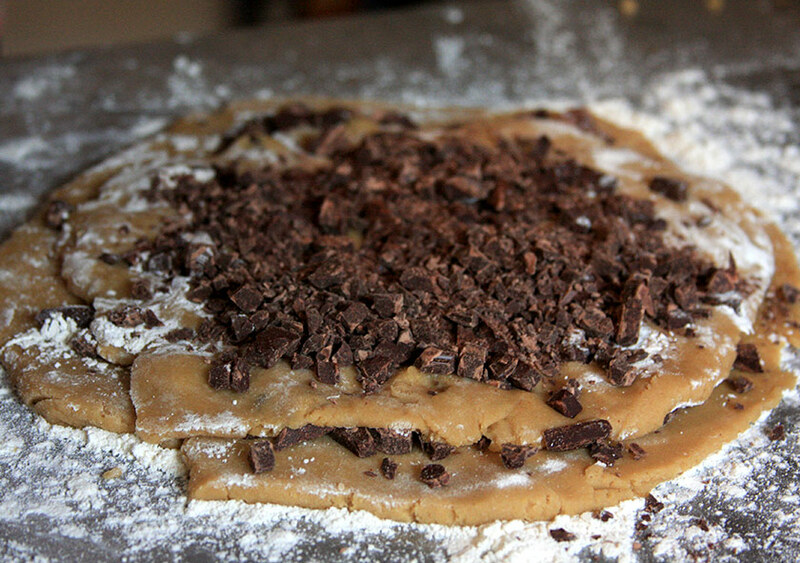 Lay the next piece of dough on top of the first layer of dough and chocolate. 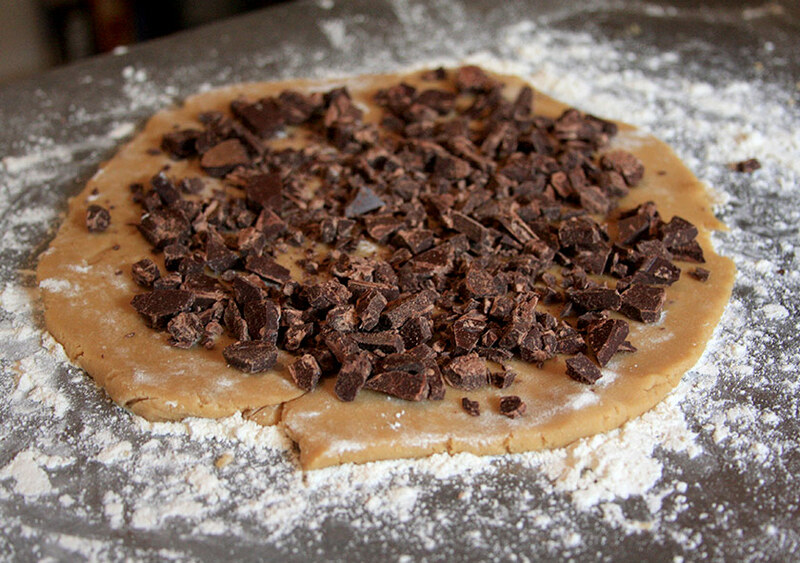 Sprinkle the remain chocolate on the dough and then cover with the final piece. 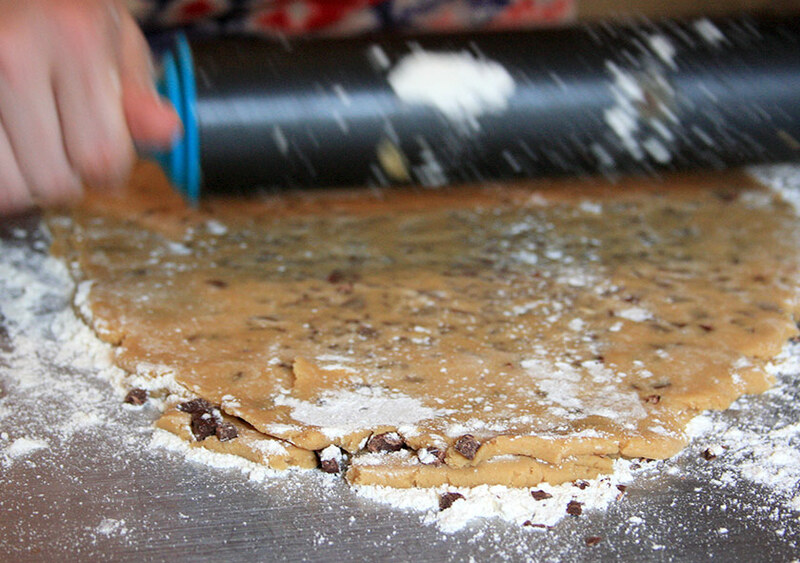 Lightly dust the top of the dough and chocolate stack with flour and then gently role with a rolling pin into a 9 by 6 inch rectangle with 1 1/2 inches of thickness. Take a thin rimmed glass and cut out as many circles as possible. 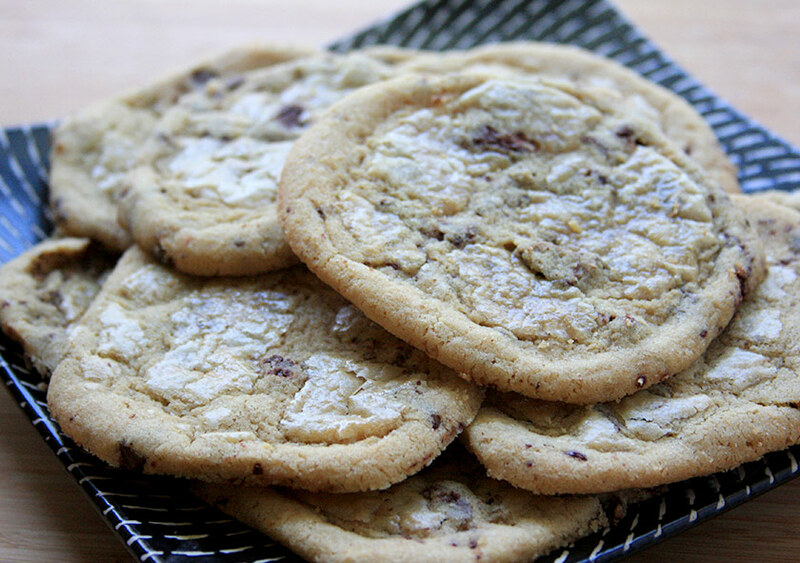 Gather together the remaining scraps chocolate and dough layers, pat lightly and cut out the rest of the cookies. 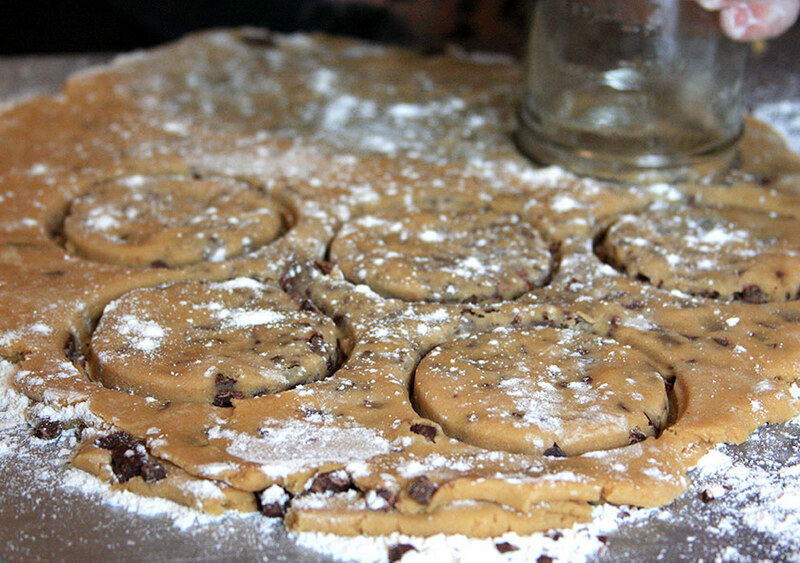 Divide the dough rounds between two cookie sheets lightly oiled. Lightly brush the beaten egg on the tops of each cookie cut outs and put the cookie sheets in the oven to cook until golden which will be between 12 to 15 minutes. Let the cookie sheets cool for 3 minutes before transferring the cooking onto a cooling rack or plate. Oh my! All the recipes look heavenly! We’re headed to California for Arthur’s second birtrhday and this looks like a perfect meal to prepare while we are there. We’ll be sure to post the results! Beautifully done blog, artistic and well written! Thank you! Please let us know how it turns out for you! And happy Birthday to little Arthur and hope you guys enjoy California! Welcome to Rhode Island and the RI Blogosphere! That chicken looks crazy good, and the cookies are going in my recipe book asap. Thank you so much for the warm welcome! We’re excited to be in this little, big state. They are absolutely amazing! Best cookies I’ve ever had. Hope you enjoy!